For the past few years, The African American Mutual Assistance Network of La Crosse (AAMAN) has hosted a June program to commemorate Juneteenth, the day (June 19, 1865) Maj. Gen. Gordon Granger of the Union Army issued General Order Number 3 in Galveston, notifying Texans and especially Texas slaves, that slavery had been abolished. While Abraham Lincoln's preliminary Proclamation was released on September 22, 1862 (more about that date later), and it took effect on January 1, 1863, many people did not hear about it until years later. News traveled slowly back then. This is a great opportunity to learn more about our city and its rich history.There will be four buses giving the same 55 minute tour on Saturday, June 23 afternoon, so seating is very limited! 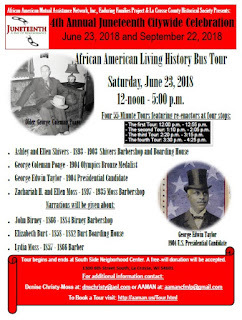 If you and your family are interested in history, the multicultural roots of our area, or what life was like more than 150 years ago for African Americans in the La Crosse area, this tour is for you. Your donation (whether or not you attend the tour) will help cover the costs of the bus, costumes, fuel, printing and publicity. The tour guides and reenactors are all volunteers. So that more students may participate in learning about Juneteenth, the Emancipation Proclamation, slavery and freedom, the 13th amendment and other aspects of Freedom Day, AAMAN is sponsoring its usual Juneteenth program at the Southside Neighborhood Center on Saturday, September 22 (the 156th anniversary of the original Emancipation Proclamation). Watch for details about that event which will include bits of the summer tour and much more, later in the season.